Regardless of database technology, it is necessary to have a monitoring setup,both to detect problems and take action, or simply to know the current state of our systems. For this purpose there are several tools, paid and free. 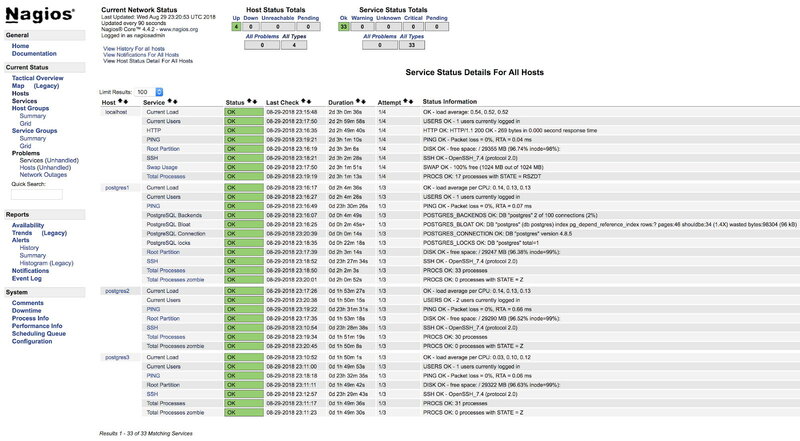 In this blog we will focus on one in particular: Nagios Core. Nagios Core is an Open Source system for monitoring hosts, networks and services. It allows to configure alerts and has different states for them. It allows the implementation of plugins, developed by the community, or even allows us to configure our own monitoring scripts. 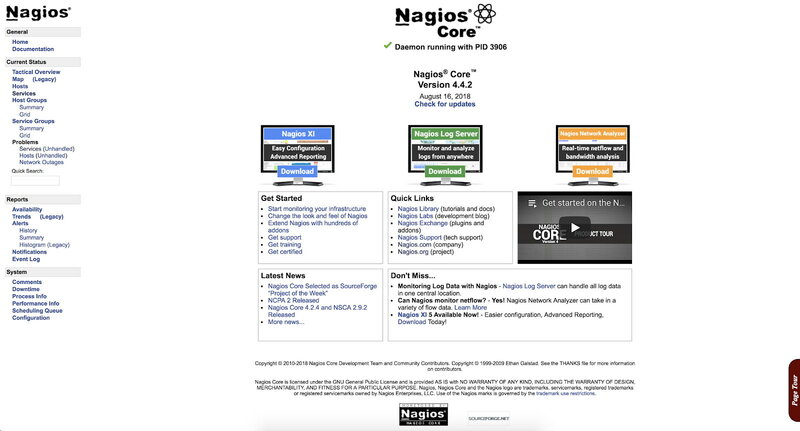 The official documentation shows us how to install Nagios Core on CentOS or Ubuntu systems. Let's see an example of the necessary steps for the installation on CentOS 7. We create the user to access the web interface and we can enter the site. Now that we have our Nagios installed, we can continue with the configuration. For this we must go to the location corresponding to our installation, in our example /usr/local/nagios/etc. There are several different configuration files that you're going to need to create or edit before you start monitoring anything. cgi.cfg: The CGI configuration file contains a number of directives that affect the operation of the CGIs. It also contains a reference to the main configuration file, so the CGIs know how you've configured Nagios and where your object definitions are stored. htpasswd.users: This file contains the users created for accessing the Nagios web interface. nagios.cfg: The main configuration file contains a number of directives that affect how the Nagios Core daemon operates. objects: When you install Nagios, several sample object configuration files are placed here. You can use these sample files to see how object inheritance works, and learn how to define your own object definitions. Objects are all the elements that are involved in the monitoring and notification logic. resource.cfg: This is used to specify an optional resource file that can contain macro definitions. Macros allow you to reference the information of hosts, services and other sources in your commands. Within objects, we can find templates, which can be used when creating new objects. For example, we can see that in our file /usr/local/nagios/etc/objects/templates.cfg, there is a template called linux-server, which will be used to add our servers. ; the value that is inherited from the generic-host template! register                        0                       ; DON'T REGISTER THIS DEFINITION - ITS NOT A REAL HOST, JUST A TEMPLATE! Using this template, our hosts will inherit the configuration without having to specify them one by one on each server that we add. We also have predefined commands, contacts and timeperiods. We have the possibility to create contacts or groups, and specify which alerts I want to reach which person or group. For our checks and alerts, we can configure in what hours and days we want to receive them. If we have a service that is not critical, we probably do not want to wake up at dawn, so it would be good to alert only in work hours to avoid this. Let's see now how to add alerts to our Nagios. Then we must add them to the file nagios.cfg and here we have 2 options. Add our hosts (cfg files) one by one using the cfg_file variable (default option) or add all the cfg files that we have inside a directory using the cfg_dir variable. We will add the files one by one following the default strategy. With this we have our hosts monitored. Now we just have to add what services we want to monitor. For this we will use some already defined checks (check_ssh and check_ping), and we will add some basic checks of the operating system such as load and disk space, among others, using NRPE. Nagios Remote Plugin Executor. This tool allow us to execute Nagios plugins on a remote host in as transparent a manner as possible. 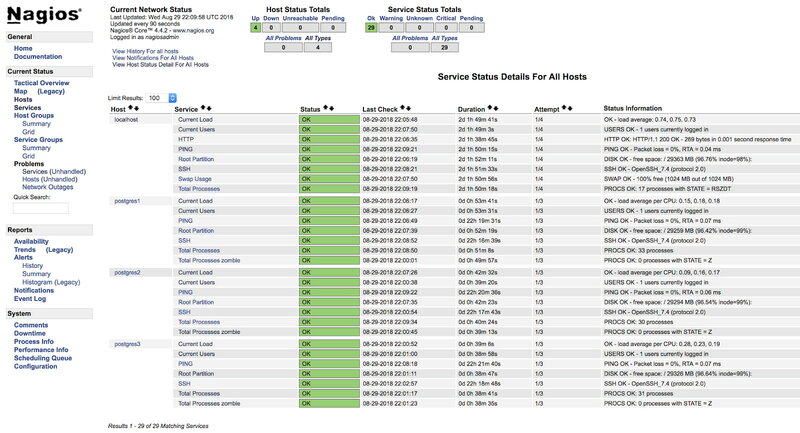 In order to use it, we must install the server in each node that we want to monitor, and our Nagios will connect as a client to each one of them, executing the corresponding plugin (s). When monitoring PostgreSQL, there are two main areas to take into account: operating system and databases. For the operating system, NRPE has some basic checks configured such as disk space and load, among others. These checks can be enabled very easily in the following way. The names in square brackets are those that we will use in our Nagios server to enable these checks. In this way we will be covering the basic checks of our server at the operating system level. We have many more checks that we can add and we can even create our own checks (we'll see an example later). Now let's see how to monitor our PostgreSQL database engine using two of the main plugins designed for this task. One of the most popular plugins for checking PostgreSQL is check_postgres from Bucardo. Let's see how to install it and how to use it with our PostgreSQL database. This last command creates the links to use all the functions of this check, such as check_postgres_connection, check_postgres_last_vacuum or check_postgres_replication_slots among others. In our example we added 4 basic checks for PostgreSQL. We will monitor Locks, Bloat, Connection and Backends. 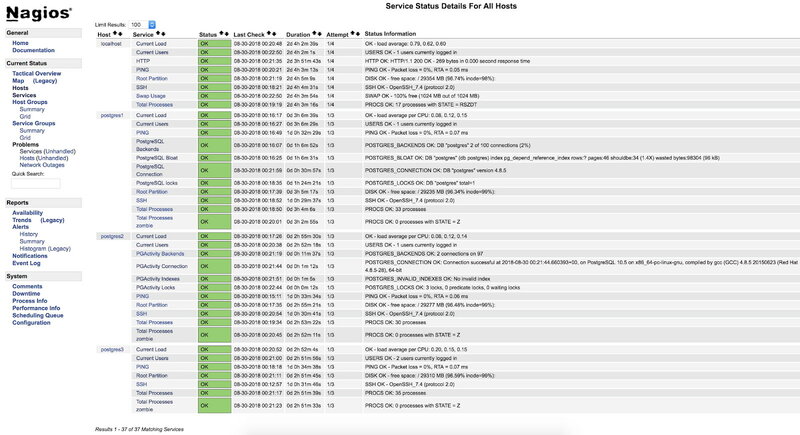 And after restarting both services (NRPE and Nagios) on both servers, we can see our alerts configured. In the official documentation of the check_postgres plugin, you can find information on what else to monitor and how to do it. 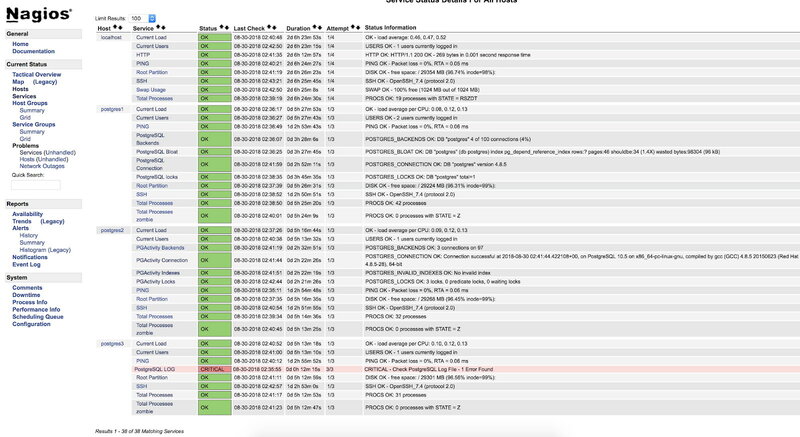 Now it's the turn for check_pgactivity, also popular for monitoring our PostgreSQL database. In our example we will add 4 basic checks for PostgreSQL. We will monitor Backends, Connection, Invalid Indexes and locks. One of the most important checks, or the most important one, is to check our error log. Here we can find different types of errors such as FATAL or deadlock, and it is a good starting point to analyze any problem we have in our database. To check our error log, we will create our own monitoring script and integrate it into our Nagios (this is just an example, this script will be basic and has plenty of room for improvement). We will create the file /usr/local/nagios/libexec/check_postgres_log.sh on our PostgreSQL3 server. echo "CRITICAL - Check PostgreSQL Log File - $ERROR Error Found"
echo "OK - PostgreSQL without errors"
In our example we will only use 2 states, OK and CRITICAL, since we are only interested in knowing if there are errors of the FATAL type in our error log in the current hour. The text that we use before our exit will be shown by the web interface of our Nagios, so it should be as clear as possible to use this as a guide to the problem. 2018-08-30 02:29:49.531 UTC  FATAL:  Peer authentication failed for user "postgres"
2018-08-30 02:29:49.531 UTC  DETAIL:  Connection matched pg_hba.conf line 83: "local   all             all                                     peer"
For more information about what we can monitor in our PostgreSQL database, I recommend you check our performance and monitoring blogs or this Postgres Performance webinar. When configuring any monitoring, either using plugins or our own script, we must be very careful with 2 very important things - safety and performance. When we assign the necessary permissions for monitoring, we must be as restrictive as possible, limiting access only locally or from our monitoring server, using secure keys, encrypting traffic, allowing the connection to the minimum necessary for monitoring to work. With respect to performance, monitoring is necessary, but it is also necessary to use it safely for our systems. We must be careful not to generate unreasonably high disk access, or run queries that negatively affect the performance of our database. If we have many transactions per second generating gigabytes of logs, and we keep looking for errors continuously, it is probably not the best for our database. So we must keep a balance between what we monitor, how often and the impact on performance. There are multiple ways to implement monitoring, or to configure it. We can get to do it as complex or as simple as we want. The objective of this blog was to introduce you in the monitoring of PostgreSQL using one of the most used open source tools. We have also seen that the configuration is very flexible and can be tailored to different needs. And do not forget that we can always rely on the community, so I leave some links that could be of great help. Sebastian Insausti has loved technology since his childhood, when he did his first computer course (Windows 3.11). And from that moment he was decided on what his profession would be. He has since built up experience with MySQL, PostgreSQL, HAProxy, WAF (ModSecurity), Linux (RedHat, CentOS, OL, Ubuntu server), Monitoring (Nagios), Networking and Virtualization (VMWare, Proxmox, Hyper-V, RHEV). Prior to joining Severalnines, Sebastian worked as a consultant to state companies in security, database replication and high availability scenarios. He’s also a speaker and has given a few talks locally on InnoDB Cluster and MySQL Enterprise together with an Oracle team. Previous to that, he worked for a Mexican company as chief of sysadmin department as well as for a local ISP (Internet Service Provider), where he managed customers' servers and connectivity. This is part 2 in the series where we put different cloud providers head-to-head to see which one stands out. This blog is about benchmarking Amazon RDS using pgbench and sysbench and then comparing it to Amazon Aurora. Business continuity for databases means databases must be continuously operational even during the disasters. It is imperative to ensure that production databases are available for the applications all the time even during the disasters, otherwise, could end-up being an expensive deal. In a busy database environment with larger size databases, the need for real-time data replication is a common occurrence. Applications often need the production data to be replicated in real-time to remote sites for analytics and other critical business operations needs. This blog provides an overview of several options you can use to replicate your PostgreSQL data to a remote site. A multi-part series of articles on PostgreSQL benchmarking in the cloud. Part one is an overview of available benchmarking tools for PostgreSQL followed by testing Amazon Aurora PostgreSQL based on the Amazon Guide for Benchmarking PostgreSQL.